Just as the name suggests, metal whiskering appears as thin strands growing out of a metal product like a whisker. According to Wikipedia, it is a “crystalline metallurgical phenomenon involving the spontaneous growth of tiny, filiform hairs from a metallic surface”. It is primarily observed occurring in elemental metals (read “close to pure” metals), but also noted in certain cases to be alloys. 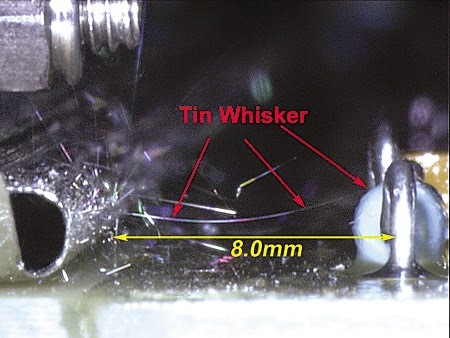 The most commonly encountered phenomenon is tin whiskers growing out of tin solders in electronic products. Zinc whiskers are also common in galvanized metals, and even silver and gold whiskers are encountered in some cases. Tin whiskers growing on tin plated connectors (image taken from Empfasis). To illustrate an example of whiskering due to compressive mechanical stress, one frequently encountered phenomenon is system failures in computer server rooms. Zinc whiskers grow from galvanized (which is zinc plated) metal surfaces, such as the underside of raised galvanized floor tiles, at up to 1mm per year. Their growth is thought to be formed from mechanical stresses induced when they are walked upon. When the tiles are disturbed, the whiskers became airborne, and due to their miniature sizes they managed to bypass air filters and settle within equipment, finally shorting out the circuitry and creating system failures. One recent publishing in “Physical Review Applied” by a Victor Karpov from University of Toledo in Ohio may suggest an alternative theory to explain why the growth happen. In Karpov’s paper, he suggested that the strands grew out not directly due to mechanical stress but from electric fields generated by the metal itself. Tin whiskers growing from tin-plated card guides. 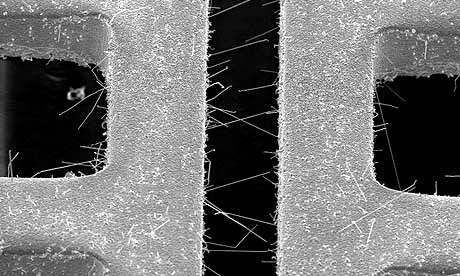 It can be seen from this image how tiny the strands are and that they have no problem bridging long distance relative to their size (image taken from Unclipped, originally from NASA Electronic Parts and Packaging Program). In this theory, stress or irregularities on the metal surface could create areas of positive and negative electrical charges. Each of these charged areas could generate an electrical field that repels particles of the same charge. Particles of metal of the same charge on the surface will be repelled this way, shooting away from the surface and forming a strand that grows as more particles are expelled. Although the theory is under verification, it helps explain the role played by stress and contaminants in whisker growth. Another effect the theory may help shed light on is the fact that whisker grows out slowly but sprout quickly after a month or so. Microscopic view of tin whiskers (image taken from Lockheed Martin). Due to miniaturization, components and circuit lines are placed as close to each other as processes allowed, so when tin whiskers grow out of them, they could potentially touch the other conducting element, be it a component or a circuit line, thus shorting the circuit. Even if they do not touch each other, tin whiskers could still promote arcing. The minimum recommended spacing between circuit lines and components usually takes into consideration the possibility of electric charges discharging through air or non-conductive materials, thus still shorting the circuit without any conductive contact. With the propagation of tin whiskers over circuit board, this distance is minimized further, causing unintended effects. Short circuit is not the only problem caused by tin whiskers. In high speed circuitry and in frequency applications above 6 GHz, the thin strands act as miniature antennas which could cause reflections and affect circuitry impedance. The strands can also break off in certain cases and cause mechanical failures in miniature products, such as bearing failures in computer disks. 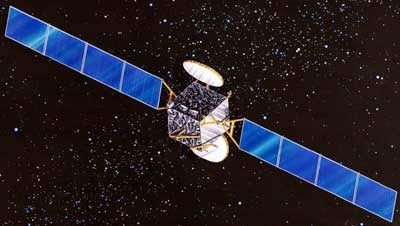 The Galaxy IV communication satellite was announced lost in 1998 due to tin whisker formation which shorted the main control computer. The satellite is still orbiting in space to date (image taken from Gunter's Space Page). The history of metal whiskers is relatively old, with the first discovery occurring back in the 1940s by telephone companies. Cadmium, being the primary choice for electroplating electrical components at that era, was discovered to grow whiskers and caused shorting and system failures in electrical products. Similar problem was discovered when pure tin was used as replacement. Bell Laboratories initiated a long term research into the phenomenon along with several large organizations, culminating in much of the subsequent knowledge and establishing whisker mitigation practices that are still in use to date. One of the most famous, and most costly, failure is the lost of Galaxy IV communication satellite in 1998. Its lost was attributed to the formation of tin whiskers, which broke through the conformal coating, shorted the circuitry and caused the failure of the main control computer. The manufacturer, Hughes, changed the plating to nickel to mitigate this problem, adding the payload weight. A less dramatic but still attention catching event was the false alarm of Millstone Nuclear Power Plant in Connecticut. In April 2005, the plant detected an unsafe level of pressure drop in the reactor’s steam system, prompting a shutdown. Investigations revealed that the pressure level was nominal, and the alert was due to a short circuit in the steam pressure line monitor’s circuit board, which cause was attributed to a tin whisker. The interested engineer is highly recommended to go to the following sources, especially the NASA webpage, for a more comprehensive understanding of the whiskering phenomenon.